Top Ghanaian female reggae/ dancehall blogger and promoter popularly known as Jullie Jay-Kanz has called on Ghanaian reggae dancehall musicians to take an object lesson from Vybrant Faya's demise. The award winning nurse and promoter who was on the Midweek Madness show on Y 107.9FM this morning to premier her riddim project christened "Mind Healing Riddim" adviced it would be necessary reggae and dancehall artistes unite to form a formidable force to espouse the genre. Talking to Soulman ,the host of the show , Jullie explicated that ,if some people who claimed to had had a feud with Vybrant Faya knew he would pass on so soon ,they would have made peace with him. 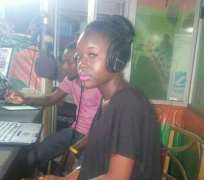 She said: "Vybrant Faya's demise has left many in a state of croaking. I still don't want to believe he is gone. This should serve as a lesson to Gh Reggae/dancehall artistes. We should learn how to live in peace with one another because you don't know when a brother will leave. So many people were fighting with "Vybrant" and now that he is no more where will you find him to make peace." Not only did she advice artistes on unity but she extended her plea for peace among all Ghanaians as well.